All transactions are safe and secure with a reliable history in online purchasing behind each of our associates. 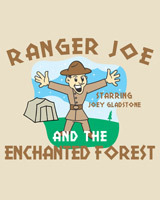 Buy the Ranger Joe t-shirt to own Full House clothing and merchandise. Throughout the years, Joey Gladstone had a number of jobs. Aside from being a standup comic and caregiver, he was also a host for the Rush Hour Renegades radio show, a jingle writer for J&J Advertising and the host of the Ranger Joe children's TV show. This Full House t-shirt highlights his time as Ranger Joe. Along with sidekicks Mr. Woodchuck and Lumberjack Jess, Joey was able to capture the hearts of children everywhere. If you were one of his fans, show it with this unique design. In addition to the Ranger Joe tee above, browse the Full House Clothing Gallery for more apparel like men's and women's clothes, kids shirts or hoodies.